Im trying to set up a fake AP using aircrack-ng suite, DHCP server & iptables. then, I've noticed that it has Https on the address, sslstrip should strip down the s from https, so that was odd also. I suspect that maybe I have a problem with my bridging (iptables), any help? You have different problems here. 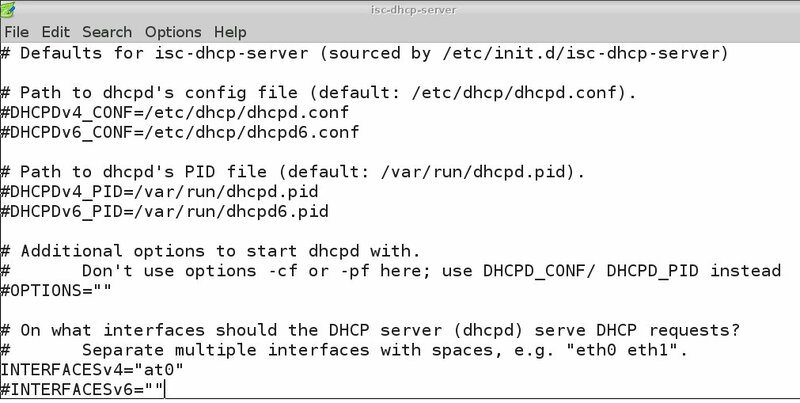 I think access point and dhcp are ok. Let's talk about iptables and sslstrip. on sslstrip, you are using arguments -f -p -k 10000 but it makes no sense... port 10000 is default. And to set port you must use -l so you can avoid its use. Should be sslstrip -f -p -k and that's all or you can put sslstrip -f -p -k -l 10000 which is the same. Talking about iptables and forwarding. echo 1 > /proc/sys/net/ipv4/ip_forward is ok. The route add makes no sense. You already have internet access on eth0 (I guess), so you don't need a route for the fake ap network. Of course at0 ip must be a different network range than eth0. Put a different ip range, something like 172.16.0.0/24 for example or any other. But the order of the rules in iptables is important. Masquerading must be done at the end. And you have a typo on ssl port. You put 1000 instead of 10000!!!! <- OP edited his question and corrected it. And then, if you have the general policy FORWARD with ACCEPT, it doesn't make sense to do FORWARD rules with -j ACCEPT like this iptables --append FORWARD --in-interface at0 -j ACCEPT. Forget rules about udp... web navigation is tcp, so this is not important: iptables -t nat -A PREROUTING -p udp -j DNAT --to 192.168.1.1. The only point of doing this is to redirect dns traffic to your own dns server... But I can't see you have a dns server on this example so makes no sense. Anyway, I can recommend to you a script on which I'm collaborating which automatize all of this stuff and is very handy!. It has a lot of FakeAP/Evil Twin features: airgeddon. Give it a try! is a good script already included in BlackArch, Wifislax and ArchStrike repositories. Good luck! and remember to test sslstrip you must use urls without explicitely putting https. And facebook is a bad starting point because of HSTS. Try with outlook.com it works! To avoid HSTS is more advanced, you'll need sslstrip2 (is called too sslstrip+) and you'll need a proxy+dns (another incoming feature of airgeddon which is already developed and is under testing phase, is in a development branch and maybe this week could be in master). Not the answer you're looking for? Browse other questions tagged network kali-linux iptables sslstrip aircrack-ng or ask your own question.